Please join us in this years long term as we go caving at California and Moaning Caverns, and Whitewater Rafting for 2 days at the American River. We will start with spelunking at both caverns, plus, we will be rapelling down a cavern taller then the Statue of Liberty and zip-lining 1500 ft. It will be a most memorable trip. We will then venture up beyond Sacramento to American River for 2 exciting days of whitewater rafting where we will be fed by the rafting company and enjoy fabulous meals. This will be trip filled with exciting fun!!! Medical forms must be current. Adults who are participating on anyone of these activities (spelunking, rapelling , zip lining or white H20 rafting) must have a current medical on file also. Day 1: Sunday – August 10th Pack a sack lunch Meet at CPE north-east parking lot, from there we will drive to moaning Caverns campsite and setup our base camp for the next few days. 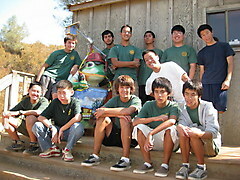 Day 2: Monday – August 11th We will be venturing to California Caverns. Here you will take a tour and explore the historic ‘Mammoth Cave’ area and ‘Jungle Room’ by walking crawling, wiggling and squirming through natural passages that connect through thirteen chambers. It will take around 4 hours. You'll be able to take a shower after completing the caving adventure. 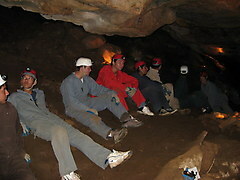 Day 3: Tuesday – August 12th Today we are caving at Moaning Cavern. You will tour one of California’s largest cave chambers. You will be rappelling 165 feet of rope down into the cave and explore the chambers and passages of the cave. Last but not least you will zipline 1500 feet through the air. Day 4: Wednesday – August 13th Break-up camp and before heading to the river, we will tour Big Trees State Park - a 1.5 mile trail where you will see some of the world's largest and oldest trees. 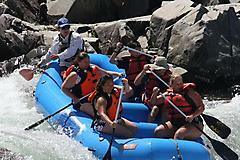 We will then head out for the river runners campground on the American River. We will setup camp again and stay here for the remainder of the trip. Once camp is setup, you will be able to relax and enjoy yourself, cooling off in the river. Day 5: Thursday – August 14th Start the day out with a hearty omelet breakfast prepared for us by the staff of the rafting company. 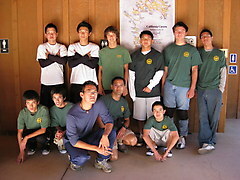 There will be a short orientation after we eat and a training session to prepare us for the rapids. Soon you’ll be on the water. We will stop for lunch prepared by the staff and continue down the river. After we return from the water, we will have enough time to rest, before the staff of the rafting company feeds us dinner. Day 6 Friday – August 15th: Start the day with a hearty pancake breakfast prepared by the staff and then board a bus to our upper river destination. We will raft down the rapids and journey down the river. 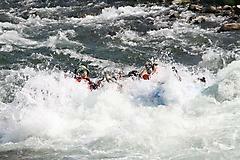 This part of the river has some of the more challenging rapids. 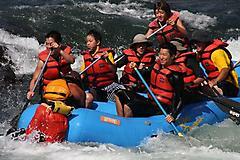 We will float down past ‘Sutter’s Mill’ and the birthplace of California gold rush. By the time we are finished, we will have rafted more than 23 miles over 50 rapids and enjoyed 5 delicious meals provided by river runners rafting company. Day 7: Saturday – August 16th Break camp and drive home. 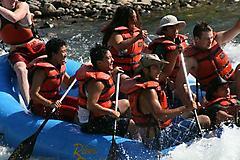 We will be having breakfast provided once again by the rafting company. Lunch will be at one of the fast food chains - bring money for that meal. We should be home in time for dinner. All scouts will call their parents 1 hour prior to our arrival home. Pleaes be on time for pickup, drivers maybe cranky and tired. You may bring personal snacks, however, it is upto the driver whether permitted to consume in their car. You will need to pack a sack lunch for day 1, We will stop and eat along the way. You may bring cards and card games. You may bring little spending money for souvenirs, etc. (no more than $50.00 in small increaments is recommended or necessary). You may bring a book to read during travel times if you like. Your personal first aid kit and 14 essentials. Daypack for carrying of personal items during our adventure. 2 nalgene bottles or camelback hydration system (whichever you have). You MAY NOT bring any electronic games or radios of any kind. This is a time to know one another and spend quality time with each other. Camera: write your name on it. Conside disposable water camera. Write name on all clothing. Green scout shirts all look the same. DO NOT PACK A SUITCASE. DUFFEL BAGS ONLY. Please make sure your medicals are upto date. If you are on any medications, please infor mMr.s Hojo. It would be verhelful if she knew any alergies also. Large plastic bags will come in handy if shoes are dirty or clothes are damp. Remember that anything you bring is your responsibility. If it gets lost, stolen or damaged, that is a risk that you are taking. This is a convenience camping trip, so if you would like or think that you need to bring additional clothing feel free to do so, but remember, you are the one that has to carry it around. PLEASE DO NOT BRING SUITCASES! PACK YOUR THINGS IN DUFFLEBAG. IT IS EAIER TO HANDLE AND PACK. You may bring some personal snacks for consumption during travel. However, it is up to the adult you are driving with whether or not you can eat / drink in their car. Please be respectful and ask. Besides your sack lunch on the first day, all other meals will be taken care of. The Troop will provide all other necessary items including the tents. All scouts in attendance will sleep two-to-a-tent.